I road the first 45 miles of the route, starting from the Whitefish Bike Retreat and then returned on the final 22 miles of the course back to the Whitefish Bike Retreat. 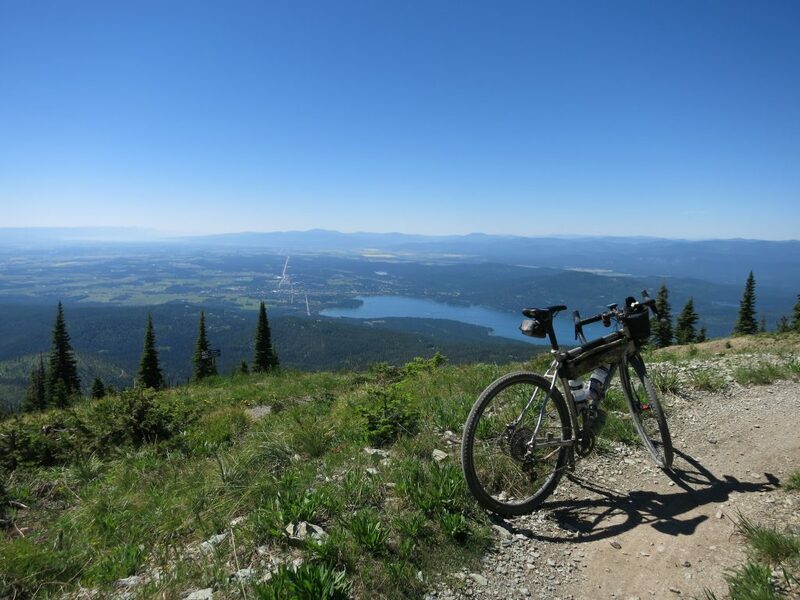 The following is intended to give you a better idea on what to expect and your experience while pedaling the JCPR – Tour of the Whitefish Divide. Mile 6.5, rolling on down into Whitefish. It might be safe to say that the toughest part of the course in length and elevation gained would be in first 28 miles where you are climbing to the top of the Big Mountain. It’s a rolling affair for the first 12 miles and then the climbing starts in earnest. The first 2.2 miles is a gravel road with a short .25 miles of pavement, then 3 miles of rolling single track, popping you out on pavement for the ride through Whitefish. All told the ascent to the top of the Big Mountain, climbs about 4,750’. There are a few sections between mile 12-15 that hit 10+% and the Summit Trail runs about 4-7%, but holds a few steeper ramps. Then you have a 10 mile downhill to rest up for the 2nd climb to Red Meadow Pass. Mile 25 or so, climbing the WMR Summit Trail. At the bottom of the down hill you have about 6 miles of climbing/rolling terrain to the Only Cut-Off/Red Meadow Pass junction. You’ll want to take a right, which will take you to Red Meadow Pass on ride day. Heading off the top of the Big Mountain, down Taylor Creek. The Red Meadows Pass to Polebridge section will be described in a follow up post regarding “Training Ride Number Two”. As well as the final 22 miles, will be described in a following post “Training Ride Number Three”. Right at mile 45, the “Olney Cut-Off” Road junction. Diamond Peak has some great powder lines. Elapsed time was about 3.5 hours from the Whitefish Bike Retreat to the Summit of the Big Mountain. Stopped to fix a tire twice, buy a Power Ball ticket with Power Play at the West Side Exxon and had a few trail side conversations with peeps along the way. The first 3.7 miles will be a neutral group ride. Miles 2.3 – 3.7 pass through private property, in receiving permission to do so, participants need to pass through this section of the course as a group. This is a re-route from the original course and alleviates the 7 miles of Highway 93 (pavement) leading in to Whitefish. If you have read the riders packet, you are aware that you will need to purchase a Powerball Ticket with a Power Play on your way through town. The Westside Gas and Grocery/Exxon opens at 6 and is at mile 8.5. There are other options to research if you are worried about a crowd. The ride was at a leisurely/moderate pace. That’s for a, kinda in shape, over the hill cyclist. It is noted in the riders packet that you need to be off the Whitefish Mountain Resort Summit Trail by 10AM. The lifts start spinning for downhill recreational riding at 10AM and the Summit Trail sees downhill traffic. This is to avoid user conflicts and for your safety. Any questions regarding the time cut off, please talk to the RD directly. The Summit House does not open till 10AM. FYI, no water at the top. If you need water, there is a spigot/hose bib at the bottom of the Summit Trail to your left on the adjacent building. It’s on the front of the building at a bike wash station, to the right of the bay windows. There are numerous road side springs on the descent from the top of the ski hill, descending the Taylor Creek Road. Be sure to stay hydrated in the am, even though it will be cool out. Be a good way to ruin your day by not consuming enough fluids right out of the starting gate. Finished up at the Whitefish Bike Retreat for a cold one. Cold KBC beer and relaxing at the Whitefish Bike Retreat. Next up, lunch at the Northern Lights Saloon. Miles 45 – 70, how long of a break will you get lulled into? Beer, burgers and a ride home. What’s up with the route?Route Info.